DOOM Classic (v2.1) — Mobers.ORG — Your Daily Source For Mobile FUN! Welcome to Hell! 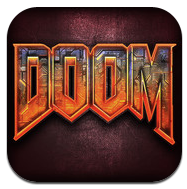 Prepare to relive the First Person Shooter that defined a generation with the legendary original DOOM - now on the iPhone. As a space marine stationed on the planet Mars, you are all that stands between the armies of Hell and their invasion of planet Earth! DOOM Classic includes the original three episodes as well as Episode Four, Thy Flesh Consumed, spread across 36 levels of non-stop carnage and action. Choose from customizable control schemes, all designed by id Software co-founder and industry legend, John Carmack. Wield unforgettable weapons like the Chainsaw and the BFG 9000 while fighting through notorious monsters like the Imp, Cacodemon, and Hell Knight!